According to the British Olympics records, she is Karen Margaret Anne MacLeod, her height is 5’6″ (168 cm), her weight is 112 lbs (51 kg), she was born in Iringa, Tanzania on 24th April 1958 and she was a member of Edinburgh Athletics Club. For Scottish endurance running aficionadas she is one of the few Scots to have run in the Olympics (the only woman to have done so apart from from Liz McColgan), runner in two Commonwealth Games and a competitor in the World Championships. Of course, for some who look for the unusual, she was ‘the athlete sponsored by Runrig, the Gaelic Rock Band from Skye’. She was married to John Davies , the former Welsh schools and Bath stand-off who became her coach as well as her husband. To examine her career as an athlete we should maybe examine her personal best times as a measure of her quality. The rankings are the all-time rankings. These are very impressive, the more so when you remember that she was running at almost the same time as Liz McColgan and Yvonne Murray and that there have been several athletes who were English/Scottish who were only so for a few years. Her list of major Games appearances is no less commendable: Commonwealth Games in 1990 (10000m) and 1994 (marathon), World Championships 1993 (marathon) and Olympic Games 1996 (marathon). And yet there is remarkably little written about her or her running. For the purposes of this profile I will draw heavily on two articles by Doug Gillon (one from the ‘Scotland’s Runner’ of June ’93 and one for the ‘Herald of 14th August ’93) as well as the usual statistical sites. It is generally assumed that she was born in the Western Isles but the truth is that she was born at altitude in Tanzania where her father was a government architect and she moved to Skye as a toddler. “When we there I spoke Swahili and had to learn both Gaelic and English”, she told Gillon, “I only remember a couple of words of Swahili now – enough to say hello to Kenyans and goodbye.” Karen left Skye at 18 and by 1993 she was a PR graduate of Dunfermline College and also had a degree in English and History and was studying for a post-grad degree in health promotion. She did not race until the age of 24 and her first race had been the 1982 Bath Half Marathon which she ran shortly after the death of her father to raise funds for cancer research. “I was a bit of a sloth,” she told Gillon, “I liked my drinking and was not that fit. I was clueless – ran in a pair of Dunlop green flash and could hardly walk the next day.” The article goes on to say: ” She met her husband during the Wells Half Marathon later that year. ‘He’d been following me for some time, then drew level and came out with this corny line about us wearing the same shoes – I’d graduated to a real pair by then. John decided I should become more competitive. He reckoned I was a real wimp. I suppose I was a bit pathetic. I chased after one rival and told her she had taken the wrong route – then she beat me. I helped another girl through a stitch – and she beat me too. 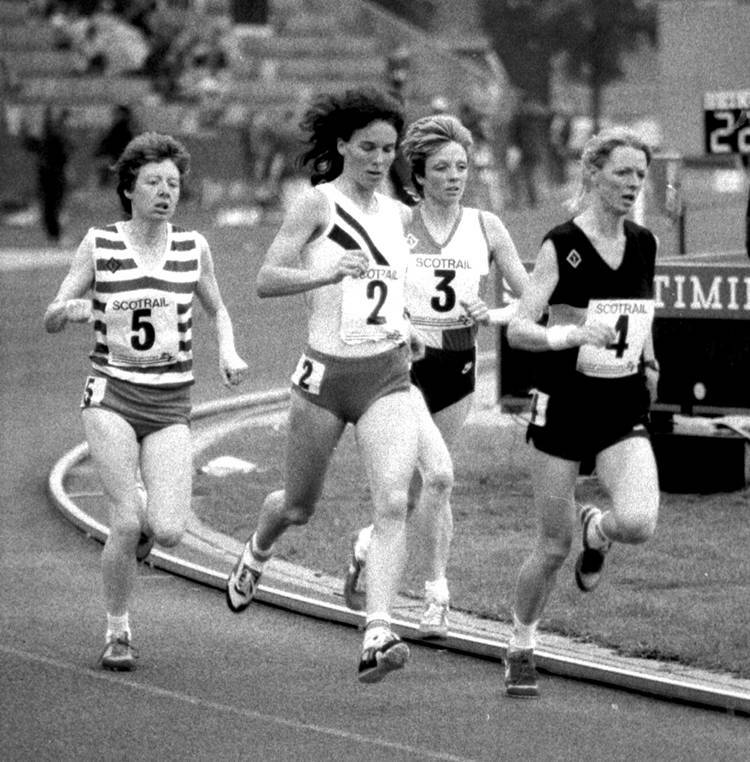 Nevertheless, after starting running as reported in 1982, she started winning Scottish titles in 1985: when she won the Scottish 4000m closed cross-country championship in 1984 she beat Yvonne Murray. She won the same title in 1986 and it was reported briefly in ‘Athletics Weekly’ thus: “SWCCU Championships held at Lochgelly on February 9th and raced over 4000m, the SWCCU ‘closed’ championships resulted in a win for Karen Macleod (EAC) in 16:07 from Penny Rother (EAC) 16:35 and Jean Lorden (ESH) 17:28.” On the track indoors she won the WAAA Indoor 3000m, also in 1987. 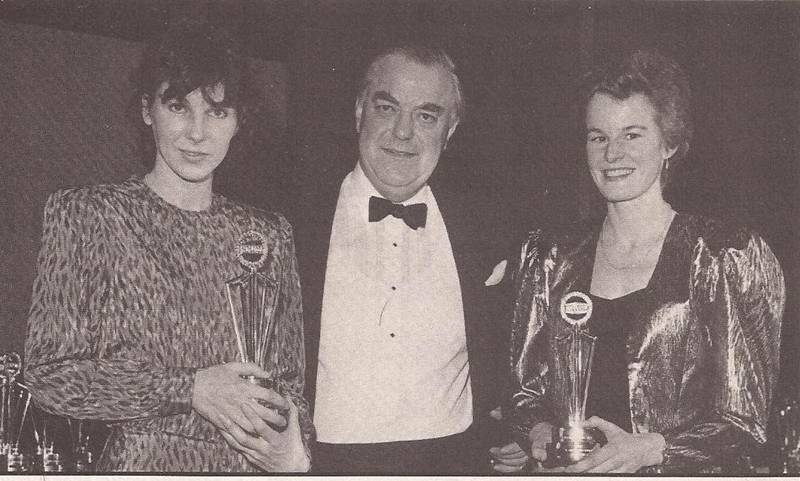 She has also won the Scottish outdoor 3000m on 19th June 1987 in 9:26.61 from Christine Haskett-Price (9:28.72) “Scotland’s Runner” reported on the race: “A cold and blustery Friday evening and the absence of Murray and Lynch conspired to ensure no fireworks. But Karen Macleod did a competent job in adding the Scottish title to her UK indoors one. With two laps remaining she finally broke fellow international Chris Haskett-Price, opening an ever increasing gap by the bell. Although Chris closed on the final stretch, a last lap of 72.71 seconds was fast enough for Macleod to hold on.” At the end of 1987 she was ranked tenth in the 1500m with 4:25.89 and eighth in the 3000m in 9:25.50. Victory by 24 seconds as Liz Lynch and Yvonne Murray race elsewhere. Karen MacLeod was racing to an impressive victory in the Scottish Women’s 4 miles cross-country championships at Cowdenbeath on February 22nd. The Edinburgh AC runner, born in the Western Isles but now living in the Bristol area, stayed with the leaders during the early stages but soon pulled away on a steep uphill stretch of heavy plough and created a gap of nearly 100m which she maintained all the way to the finish. Despite being badly hirt in a horse riding accident a few years ago, Karen has fought back with such tenacity and courage from the injuries which threatened to terminate her athletics career, that during the past 12 months her successes have included the Scottish ‘closed’ cross-country title in 1986, the WAAA indoor 3000m crown and now her first ever national cross-country championship.” Further through the article it said that she had, by her victory, gained automatic selection for the World Championships in Warsaw. The Scottish Championships in 1988 were held at Crown Point Track in Glasgow and on the Friday night of 22nd July she lined up for the start of the 3000m race just as the rain started to fall. She retained her title though in a race described as follows in “Scotland’s Runner” as follows. “Fast finishing Alison Jenkins just failed to prevent Karen Macleod from retaining her 3000m title after a spirited sprint up the final straight. Macleod dominated the race, breaking away from Jenkins, Audrey Sym, Valerie Clinton, Eileen Masson and Christine Price at about 800m and building up a lead of almost 60m before being hauled back in the last lap. 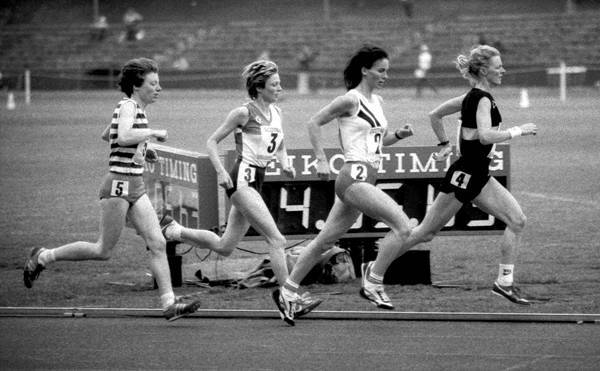 In poor conditions, Macleod’s time was well down on her 1987 Meadowbank clocking of 9:25.61.” On the following afternoon in the 1500m, Karen was fourth in a time of 4:30.63. By the end of the year the woman who would turn into one of Scotland’s best ever marathon runners appeared in four ranking lists on the track: tenth in the 1500m with the time from the Scottish championships, seventh in the 3000m in her time from the evening before and second in the 5000m with a time of 16:26.57. She had been helped through 1988 by sponsorship from Brooks, the clothing company as reported in the article below. Karen MacLeod winner of the 1987 Scottish cross-country title, is back racing again following a 16 week lay-off at the end of last year. Karen, pictured above with Alloa Brewery managing director John MacKenzie and Yvonne Murray after receiving a Skol award. The injury was a particular setback to Macleod who had enjoyed a sustained spell of success over the previous 18 months including the UK indoor 3000m title and the Scottish track 3000m title. Now based in Bristol, she and coach John Davies agreed that the entire cross-country season for which the athlete hoped to be bidding for the UK team to go to New Zealand would have to be missed. However 1988 has started on a brighter note with Karen being signed up by Brooks for shoe, kit and racing sponsorship – her first such deal. In her comeback race, eight miles over the roads in Wales on January 31st, Karen sliced three minutes off the course record with a time of 44 minutes. John Davies says the immediate aim is to improve Karen’s 10K road best of 33:26, and then transfer to track 10000 metres. He is also keen to dispel rumours that Karen is looking for a new coach! Domestically she was outshone only by Murray and McColgan although her distances tended to be more from 5000m upwards which meant that McColgan was her only real domestic rival. And so it was internationally with all her appearances at major Games being at 10000m and marathon. Having set her lifetime best of 33:17.88 in Oslo on 1st July 1989, her first Commonwealth Games was over the same distance in 1990 in Auckland, New Zealand, where she was eleventh in 34:24.71. Again the race was not without mishap: She broke ribs in the final, thumped by a flying elbow and finished the race in agony before being hospitalised. In the 1990 rankings, she was second in the 5000m with 16:20.59 and second in the 10000 with 34:24.71. 1992 being Olympic year, resigned as she said to missing out on the trip to Spain, she ran 71:45 for a half marathon in Lisbon in January and turned in a time of 2:41:35 for the London Marathon in April but then collapsed at the finish, later finding out that she suffered from a serious iron deficiency. By the time of Doug’s article in “Scotland’s Runner” she had won three marathons and with a pb of 2:34:30 at that point, plus a course record of 53;40 in the Tom Scott Road Race, she was in superb form but did not appear anywhere in the official rankings for the year. In 1993, described as a ‘Salford-based Scottish woman’ when she won the Bristol half-marathon in 75:00, she was running as well as ever again – witness the following performances from a woman who was now in the WV35 category. Her second Commonwealth Games was in Victoria, Canada, on 27th August 1994 and her build-up included a lot of fast under distance racing. In March, she went to Alphen in Holland where she was tenth in the 15,000 m road race in 52:11; in April it was 10 miles in New York where she won in 55:41 and second in the Trevira Twosome in New york. The ‘Herald’ reported it as follows: “Karen Macleod, already selected for the Commonwealth Games marathon this year, removed any doubts about her fitness yesterday in New York where she lined up with Kenyan steeplechaser William Mutwol to win the Trevira Twosome in Central Park. The race is based on the aggregate times of a man and a woman both covering 10 miles. Despite thunderstorms and pelting rain and hail, Macleod covered the distance in 55:04, the fifth fastest woman’s time of the day. Allied to Mutwol’s 47:10 it brought their team overall victory. “Everything is on schedule and Karen is running well,” said her coach anmd husband John Davies last night.” In June there were two 10,000m track races -at St Denis in France where she ran 33:34.85 on the tenth and 34:05:00 at Meadowbank on the twenty fifth to win the SWAAA championship. It all paid off in the Games marathon where she was an agonising fourth in the marathon in what would prove to be her best ever time for the distance of 2:33:16 – still the sixth best ever by any Scotswoman. After the Games on 2nd October in Thessaloniki, Greece Karen was second in in a 20000m in 70:45 and her best half marathon of the year was 73:52 in Stroud where she repeated her victory of the year before. As a result of the Commonwealth Games race, her world ranking had moved up to 86th, a considerable improvement on the previous year. In 1995 she was top in two events, second in three and third in another Scottish domestic ranking list in races – her six top times were in six different countries with a racing season that lasted from 15th January to 3rd December! The peak of any athlete’s career has to be competing in the Olympic Games and Karen attained that honour in 1996 when she went to Atlanta in the United States with Liz McColgan to run in the marathon. Again there was a lot of fast racing in the months leading up to the Games. Her fastest marathon of the year turned out to be in Houston on 21st January when she was seventh in 2:33:50 but before that there was a whole series of good runs including winning a 10K at Bourton in Gloucestershire in 33:27 in February, 55:34 to win the 10 miles at Ballycotton in Ireland, she won the 5 miles road race in Nailsea in late June in 27:27 and in Atlanta before the Games she ran a half marathon in 75:55. She also won the Isle of Skye half marathon in a new record time of 1:22:21. In the Games however, there was a big field and a very good field and Liz was sixteenth with Karen forty fifth in 2:42:08 and Suzanne Rigg (the remaining GB runner) fifty eighth. Although Karen never ran as a veteran or in any veterans events, she is listed in the Scottish Athletics Yearbook as having run 16:59 for 5K on the road (she would have been 39 then) , 36:08 for a 10K and 17:17.2 for 5000m on the track. A final note – on 14th July 2008, a Karen MacLeod ran in the Isle of Skye Half Marathon as a FV 50+ where she finished 250th in 2:49:50. Was it the same Karen MacLeod? Yes, it certainly was – and it was only four weeks following her kidney transplant operation! A quite remarkable feat and possibly as good as any run she had ever done. Karen and her sister Deborah are now keen advocates for organ donation and feel that more people should be aware of the programmes. Read about the transplant via this link.